When a bitchin' day at the beach goes horribly wrong. "The day I died was a great day for the beach. One of those super days... All bright and sunny... I was feelin' real good. Proud, too... 'Cause this was my car! I'd only had it a week. I bought it with my own money, money I'd earned working after school at the supermarket. You know, as a bag boy. I'd been saving up for this little old car for so long... Now, I was getting a real bang out of showing it off..."
A 17-year-old boy is psyched to go to the beach in the car he'd just bought a week previous, and he has a fun day with his young pals. Then things go to the Dark Side when one of his buds breaks out a 7-Up bottle full of vodka he'd swiped from his folks, and the liquor gets shared by the group of five happy-go-lucky teens. As the day winds down and the bottle is emptied, the kids leave, and out 17-year-old narrator, who freely admits that he "was not used to the stuff," drives off in his car by himself, the other preferring to leave with his buddy Joe, the supplier of the vodka. While attempting to pass an old lady in a Mercedes, our nameless narrator meets his fate in a tragic car accident...but continues to narrates the events following his body being hauled out of the twisted wreckage, including his parents coming to the morgue to I.D. 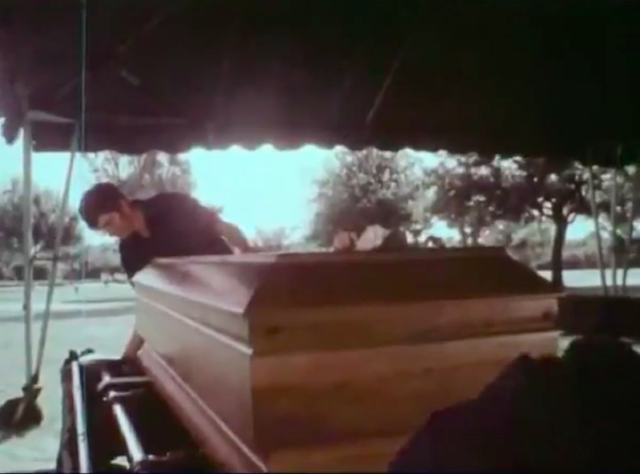 his corpse, his friends and family mourning at his open-casket wake (where his body shows zero signs of having been in a terrible vehicular wreck), and finally his coffin being slowly lowered into the waiting grave at his funeral. 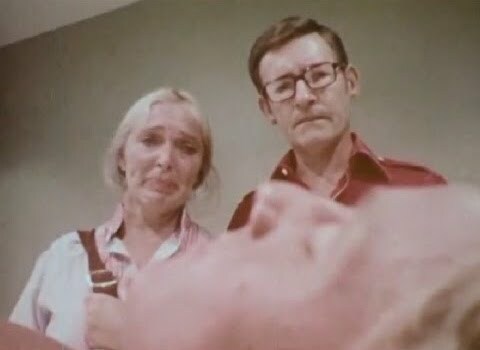 Parental anguish...or disgust over their now-dead son being a dumbass? Having not seen one since maybe 1979, I have no idea what automotive safety films geared toward teens about to get their driver's licenses are like these days, but the ones geared toward my generation and those that came before were nearly always morbid exercises in cheap (but effective) scare tactics and often unintentional hilarity. THE DAY I DIED is a prime example of the genre, only minus the lingering shots of simulated gore found in many other examples, but what it lacks in gore it more than makes up for with over-wrought cheap shots to the emotions. 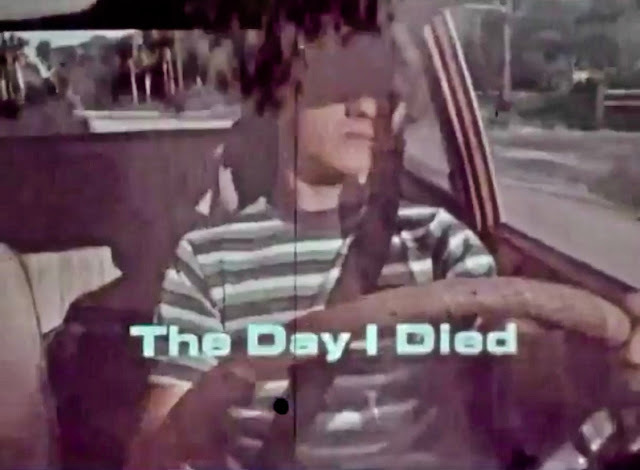 One would think that anyone could relate to the short's events, what with a nice kid's day in his just-obtained car being spoiled by his booze-induced premature demise, but to many of us who grew up in the suburbia of the late-1970's and early-1980's, the details of the inciting incident don't necessarily add up. While it's clear that the group of five kids involved are alluded to as having a certain amount of experience with alcohol, save for our narrator, who admits he's a lightweight, if one does the math, it seems unlikely that one bottle of vodka divided five ways among kids consuming it with food would be enough to hamper a driver's ability unto the point of fatal lack of automotive control. Admittedly, I'm no expert, but I did grow up in Westport, CT, where hard partying was my youthful era's rite de passage, and I can tell you from personal experience that even a wine-bottle-sized container of vodka would be unlikely to render a pack of five kids from my community non-functional. And even if it did, there would have been at least two within the group who would have recognized that they or their friends were fucked-up and would not have allowed them to drive under those circumstances, either waiting it out for a modicum of sobriety or taking a bullet and calling parents for an assist. "Is this the end? The end of everything??? Don't go away and leave me all alone... Mom... Dad... Don't go away... I... I tell you, I'm not dead! Not really dead! Please don't put me in the ground! I promise... If you give me one last chance, God, I'll be the most careful driver in the whole world! I'll never take a drink like that again! All I want is one more chance! Please, God!!! I'm only seventeen!!!" And then the film simply fades to black. I know all of this sounds utterly horrible, and it certainly is, but if you have even the slightest tinge of darkness to your general sensibilities and sense of humor, the entire short comes off as a brilliant, cliche-ridden parody of this type of cautionary film, and as such it's a must-see. And it goes to show you just how fucked-up I am, because when I meet my inevitable fate, I demand that this short be run just before my wake's boozy dance party, a balls-out celebration that will kick off with Heaven 17's "(We Don't Need This) Fascist Groove Thang."